The European Union announced Tuesday it is giving the UN Children’s Fund an additional €90 million to help UNICEF to provide critical services and support to Syrian refugee and host community children and young people in Jordan, Lebanon and Turkey. The additional EU funding was signed by EU Commissioner for European Neighborhood Policy and Enlargement Negotiations Johannes Hahn and UNICEF Executive Director Anthony Lake. This latest contribution brings the total funding from the EU Trust Fund for UNICEF’s work on the Syria crisis response to nearly €200 million, the EU said in a press release. As families around the world prepare for the return to school, the European Union (EU) has renewed its commitment to get children affected by the war in Syria into education. This €90 million support is provided by the EU Regional Trust Fund in Response to the Syrian Crisis and will enable UNICEF to provide critical education and protection services to Syrian refugee and host community children in Jordan, Lebanon and Turkey, so that they can attend school and learn, the press release said. “I cannot stress enough the importance of promoting and providing access to quality education for children and young people in all countries affected by the Syrian crisis”, said Johannes Hahn, during the signing ceremony. “This is about creating hope, and doing what we can to ensure there is no ‘lost generation’. In a related development, the Turkish Anadolu news agency reported Wednesday that the European Union has transferred €838 million ($1 billion) out of the €3 billion ($3.6 billion) it had pledged as a first payment to support Syrian refugees in Turkey. In November 2015 and March 2016, the EU pledged to transfer two financial packages to the Turkish government by the end of 2018, each worth €3 billion, to help Turkey meet the needs of Syrian refugees. The two sides agreed at the 2015 summit to allocate €1.3 billion ($1.56 billion) for humanitarian relief and €1.7 billion ($2 billion) for education, health and infrastructure, migration management and social and economic support projects, Anadolu recalled. 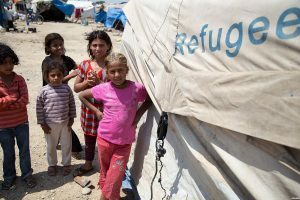 With the Syrian conflict now in its seventh year, around 2 million children from Syria live as refugees in Jordan, Lebanon and Turkey, adding pressure on already stretched host communities and their administrations. Posted by Peter Mulvany on Sep 20 2017. Filed under Headlines, World News. You can follow any responses to this entry through the RSS 2.0. Both comments and pings are currently closed.